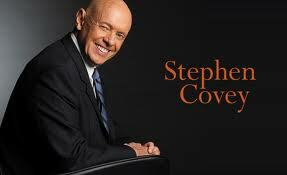 On Monday, July 16, Dr. Stephen R. Covey, author of The 7 Habits of Highly Effective People and founder of FranklinCovey Co., died as the result of a bicycle accident at the age of 79. His books, including The 7 Habits, First Things First, The 8th Habit: From Effectiveness to Greatness, and Principle-Centered Leadership, sold millions of copies (more than 25 million worldwide for The 7 Habits alone). He was named one of TIME Magazine's 25 Most Influential Americans and received The National Entrepreneur of the Year Lifetime Achievement Award for Entrepreneurial Leadership. Follow the 7 habits. These are: (1) be proactive, (2) begin with the end in mind, (3) put first things first, (4) think win-win, (5) seek first to understand, then to be understood, (6) synergize (use positive teamwork), and (7) sharpen the saw (balance and renew personal resources for work-life balance). Be organized. Long before smartphones and even PDAs, there was Franklin Covey’s Franklin Day Planner in which to keep notes on appointments, contacts, and other vital business information. For many years, it was my mainstay for organization. Align your values with principles. In Covey’s view, principles are external laws of nature, but values are internal and changeable. Essentially, he advised that you make sure that your head is on straight. Be a teacher. He was a professor at Utah State University’s School of Business. While I never took any of his courses, here or in his previous positions, I’m sure he had a lot of valuable information and advice to impart. Keep family first. Success in business is meaningless without family to share it with. Covey was a husband who had nine children and 52 grandchildren. He led an exemplary life. He’ll be missed.